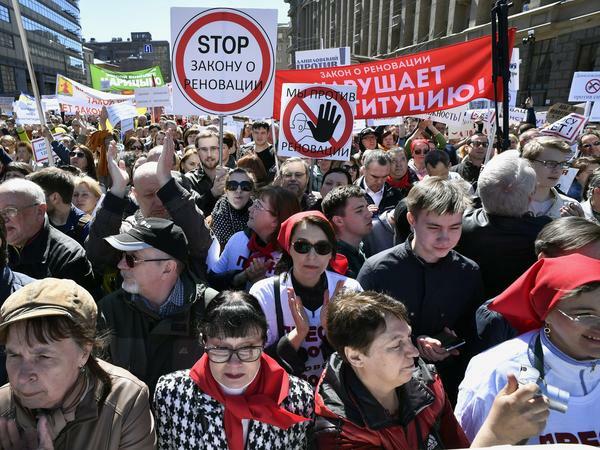 Demonstrators march in Moscow on Sunday against the city's controversial plan to knock down Soviet-era apartment blocks and redevelop the old neighborhoods. Anna Sazonkina and Vladislav Komissarchuk (holding baby), oppose their north Moscow apartment building being torn down. Their neighbor Roman Gorsky (right) says he plans to vote for its demolition. High-rises tower over five-story brick buildings in south Moscow that may be torn down under the city's "renovation" program. Anna Sazonkina never used to go to rallies. The 41-year-old viola teacher and her husband, an oboist, were too busy raising their four boys. But on Sunday, the couple went out to protest for the first time in their lives, joining thousands rallying in downtown Moscow to save their homes from the wrecking ball. Earlier this year, Russian President Vladimir Putin gave his blessing to Moscow Mayor Sergei Sobyanin to knock down thousands of Soviet-era apartment blocks and resettle as many as 1 million residents in modern high rises. One of the most enduring legacies of communist rule in Russia has been a housing stock that was often hastily built, long neglected and now is falling into various stages of disrepair. Yet not all Muscovites have welcomed Sobyanin's urban renewal plan, which the city is calling a "renovation program." 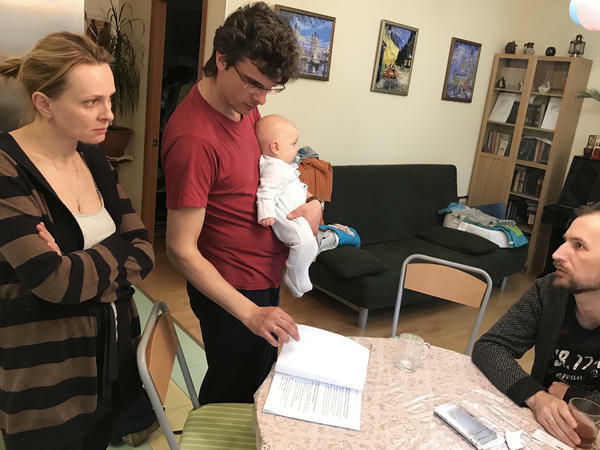 When Sazonkina and her husband, Vladislav Komissarchuk, bought their modest three-bedroom apartment in north Moscow last August, they thought they'd finally found the perfect home. The 800-sq.-ft. walk-up is on the third floor of a five-story brick building constructed in the 1960s. "We were so happy, and this flat was in very good condition," said Sazonkina, cradling their 4-month-old son in the open-plan kitchen. "It looked like it was built especially for our family." Sazonkina loves her leafy courtyard, the nearby school and the fact that her mother lives a 10-minute walk away. But the building is now on a list of 4,500 mostly 5-story apartment blocks that the city wants to tear down. This week the the city began polling residents of buildings slated for demolition; according to the mayor, if two-thirds of a building vote against it, their homes will be spared. Many homeowners are skeptical of the voting procedure, especially as not a single "no" vote was registered in more than 60 districts on Monday, the first day of voting. Sazonkina figures that most of her neighbors will vote for resettlement in the poll. But she's opposed; she says her constitutionally-guaranteed property rights are being violated, since she's not being given a real choice. "They'll make our life hell, and sooner or later they'll squeeze us out," Sazonkina said. "But my civic conscience won't allow me to vote for it." As Sazonkina found out at the protest she joined on Sunday, she isn't alone. Homeowners are also venting their anger in online groups and holding grassroots seminars on how to defend their property rights. Opponents of the plan don't believe the mayor's promise that they'll receive an apartment of equal size in the same district. They also doubt the quality of the new buildings and fear that Moscow will become a concrete jungle of 20-story high rises. Most of all, they don't like being treated like "sheep led to slaughter," as Sazonkina puts it. Yuliya Galyamina, a linguist turned civic activist who organized Sunday's rally, believes the real reason for the mass resettlement program is to revive the Moscow real estate market, which has been battered by Russia's economic downturn. "The government treats the people like Soviet people, but there are no Soviet people anymore," said Galyamina. "People are different now. They've become property owners and have a sense of self-respect." Galyamina claims "Putin's friends" came up with the demolition plan because they view their fellow citizens as nothing more than a source of income. Sergei Zverev, the head of the construction committee in Moscow's city council and a member of Putin's party, smiles when he hears such accusations. "Of course we can blame everything bad on our president, but we should recognize that he supports our idea," he said. "Name just about any issue and you'll find someone who's against it and says, 'You're violating my rights.'" Zverev argues that most Muscovites affected by the resettlement program would prefer new housing: Many of the old buildings contain wooden beams and have ancient plumbing and tiny kitchens and bathrooms. "Moscow will become more beautiful and more convenient – and most importantly, more comfortable to live in," he said. The city insists nobody will be resettled to another district, and those who don't want new apartments will get financial compensation. Homeowners like Sazonkina don't believe the mayor's guarantees. Just by being on the list of condemned buildings, the value of her property has already dropped. Sazonkina's downstairs neighbor, Roman Gorsky, says he will vote for their building's demolition, even though he shares her outrage. "I don't have any illusions about how constitutional this is, but the problem is that it's very difficult to fight with our government," said Gorsky, 43, the father of three. "My children could end up without a roof over their heads. The choice is between having some kind of home or being homeless." Their building will be demolished whatever happens, Gorksy says, so it's better to get it over with quickly to avoid getting stuck at the end of the line for a new apartment. The polling of residents is due to be completed next month. In July, the Duma, the lower house of Russia's parliament, is set to pass a bill enshrining Moscow's renovation program into law. In Russia, one of the most enduring legacies of Communist rule is a housing stock that was often hastily built, long-neglected and now falling into various stages of dilapidation. 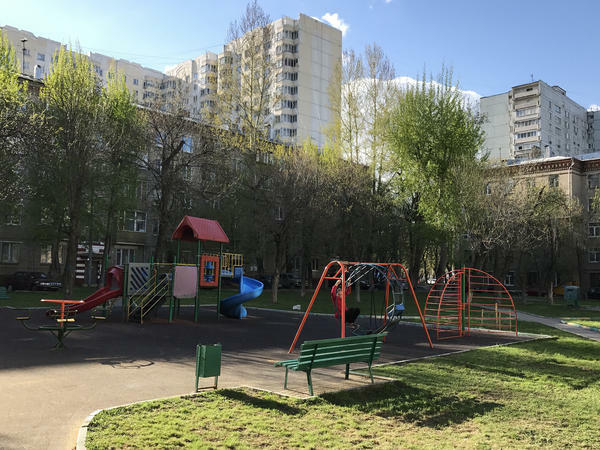 Earlier this year, Moscow's mayor, who's a close ally of President Vladimir Putin, announced an ambitious plan to knock down thousands of shabby apartment blocks and resettle up to a million people. As NPR's Lucian Kim found out, not all Muscovites are welcoming the demolition plan which the city is euphemistically calling a renovation program. LUCIAN KIM, BYLINE: When Anna Sazonkina and her husband bought their apartment in north Moscow last August, they thought they'd finally found a home where they could raise their four boys, aged 4 months to 14 years. ANNA SAZONKINA: We were so happy, really, and it was in a good - this flat is very - in a very good condition. We didn't need to reconstruct something. It looked like it was built especially for our family - very comfortable for all members of our family. KIM: The modest three-bedroom apartment is on the third floor of a five-story brick building constructed in the 1960s, of which there are thousands in Moscow and across Russia. Sazonkina, a professional musician, loves her leafy courtyard, the nearby school and the fact her mother lives a 10-minute walk away. But now her building is on a list of more than 4,000 buildings the city wants to tear down to make way for modern apartment towers. Sazonkina says most of her neighbors will vote for the resettlement in a survey taken by the city, yet she feels her constitutional rights as a property owner are being violated because she's not being given a real choice. KIM: "I believe they'll make my life hell and squeeze us out eventually," Sazonkina says, "but my civic conscience won't allow me to vote for it." Sazonkina is not alone. Other homeowners are venting their anger in online groups and holding rallies against the planned demolitions. They don't believe the mayor's promise they'll get to stay in their districts and receive apartments the same size as their old ones. And they doubt the quality of the new buildings and worry that Moscow will become a concrete jungle of 20-story high-rises. Most of all, they don't like being treated like sheep led to slaughter, as Sazonkina puts it. KIM: Earlier this month, incensed homeowners gathered for a grassroots seminar on how to defend their rights. The organizer was Yuliya Galyamina, a linguist turned civic activist, who says the real reason for the mass resettlement program is to revive the Moscow real estate market which has been battered by Russia's economic downturn. KIM: Galyamina says, "President Vladimir Putin's friends came up with the demolition plan because they see their own people as a source of income." Sergei Zverev smiles when he hears Galyamina's accusations. He's the head of the construction committee in the city assembly and a member of Putin's party. KIM: "Of course we can blame everything bad on our president," says Zverev, "but we should recognize that he supports our idea." Zverev says most Muscovites affected by the program prefer new housing. Many of the old buildings have wooden beams, ancient plumbing and tiny kitchens and bathrooms. The city insists that nobody has to worry about being sent to another neighborhood and those who don't want new apartments will get financial compensation. Homeowners like Sazonkina don't believe it. Just by being on the list of condemned buildings, the value of her property has already dropped. The city begins pulling residents this week. And in July, the Russian Parliament is set to pass a bill enshrining Moscow's demolition program into law. UNIDENTIFIED PROTESTERS: (Chanting in Russian). KIM: Sazonkina says she's never gone to a rally in her life, but yesterday, she joined thousands of Muscovites who packed a central thoroughfare chanting hands off Moscow. She says she was encouraged to see so many like-minded citizens and is ready to go back on the street to defend her home. Lucian Kim, NPR News, Moscow. Transcript provided by NPR, Copyright NPR.